Is Acorns a Bad Investment? A friend reached out to me recently to ask me about an app called Acorns . 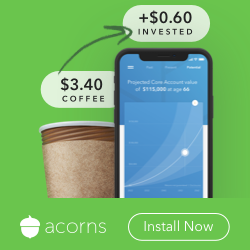 Acorns (link above) is an app that rounds your purchases up to the nearest dollar amount. "It rounds up your purchases to the nearest dollar amount, and invests the change," she said. "That could really add up for me. Should I do it?" Imagine a new weight loss app that made you do ten jumping jacks every time you ate a whole chocolate cake. Spending and saving work exactly the same way. Instead of an app that encourages spending, you need to work on actually spending less if you want to amass savings. Don’t get your wires crossed. The only way to save money is to cut out, or cut down, all those little purchases. Making purchases is at odds with saving money. A few pennies here and there, like a few jumping jacks, aren’t enough to counteract excess spending. You know what’s better than investing 26 cents when you buy a $2.74 coffee? Skipping the coffee and investing the full $3. By the numbers, that’s 1100% better, actually. Yes, that means skipping one coffee has the same power as acorns-ing eleven coffees. Now imagine what that number would be if they were Starbucks Frappucinos. Try taking Zero Day Finance's Zero Day Challenge. You won't accrue any pocket change for acorns, but you'll have whole, unbroken dollars saved up, which is much better. Remember: spending and saving are at odds. You cannot save by spending any more than you can lose weight by eating, and anyone who tells you otherwise is just trying to sell you something. Sure, you're going to need to do a little spending just to get by... but there's no need to reward yourself for it. We need to be careful which actions we reward, even subconsciously, if we want to learn good money habits. Got any debts over 5%? You need to tackle those first. Any extra pennies you may have, that you think you won’t miss, are best thrown towards those debts. The stock market does not have a guaranteed return. As an investor, your investments might lose money in the short term. The longer your time horizon is, the more likely you will come out ahead in the end. As you wait for the stock market to grow your money, your debts are still growing in a guaranteed fashion. They might be growing at a faster rate than your investments can! Instead, every extra dollar you toss as a 9% car loan or a 6.8% student loan is guaranteed to make you that much in savings on future interest. Where else can you find a guaranteed return like that? The idea is to put every extra dollar in the place where it will make the most powerful impact. Speaking of which, maxing out your tax advantaged accounts is the best way to start investing. Tax Advantaged accounts are IRAs and 401(k)s.
Got a 401k with a match? That match is free money. If your employer is offering guaranteed free money to you, you should take that match before you put a penny in acorns. Even if you have no match available to you, fill up a 401k and IRA to the limit before you invest in any taxable accounts, including one from Acorns. An IRA is your personal retirement account; a 401(k) is the retirement account through your employer. Those accounts are magical places of tax protection. Think of IRAs and 401(k)s as magic circles drawn on the floor, and any money inside them is protected from the grabby hands of Uncle Sam while the money grows. A dollar in an IRA or 401k is more powerful than a dollar in any other account, because those dollars can grow tax free without the IRS dipping into your gains every year. It doesn't seem like a lot, but over time those tax losses really add up, due to the magic of compound interest. You can choose a Roth flavor or Traditional flavor, and each one has its own powerful benefits, but both protect you from the tax man as your money grows. Since these accounts are so powerful, the government only lets you protect a certain amount of money there. You get to protect up to $5,500 in an IRA, and $18,000 in a 401(k) as of tax year 2017. Acorns recently started an IRA program, called "Acorns Later". If you are ready to invest, and want to use Acorns, do the IRA thing first. Otherwise, you are voluntarily choosing to pay extra taxes! Otherwise, if you're thinking of investing in an Acorns account, make sure you have maxed out your 401k and IRA first. This means you'll need to have already invested more than $23,500 in the current year. Acorns' fee is $1 per month, which seems small. 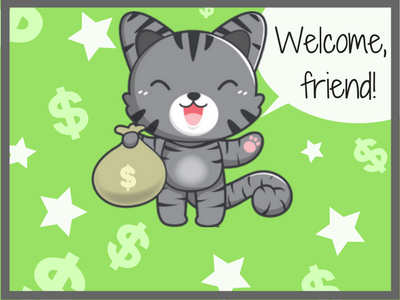 If you are investing only a small amount in Acorns, as it is designed to be used, the fee might make up a strikingly high percentage of your investment account! Considering that you'll need to make a lot of purchases to accrue even $100 in your account, to push the fee down to 1%, you'll need to have the spending habits of a shopping addict. And that's a bit like throwing the baby out with the bathwater. Compare this to other "Robo-Advisors" like Betterment, Wealthfront, heck, even Ellevest is better than that at .5%! As far as the actual funds go, Acorns offers some nice ETFs. Most of these are Vanguard ETFs, which are among the lowest cost investments available. Good job picking ETFs, Acorns! I find no fault here! One silver lining of Acorns is that it has the potential to be an inadvertent emergency fund for compulsive spenders. Those who have spent away all their money with a week left until payday are delighted to learn that they have managed to hide a little cash from themselves. More than one person I know has followed this pattern with Acorns, then raided their Acorns account when they had an emergency and couldn't afford rent. Let's be clear, not being able to afford rent doesn't necessarily make you an irresponsible person. Shtuff happens, I get it. But if you are not sure if you can make rent in any given month, Acorns is not for you. Markets go up and down. What if the rent came due and the car broke down on the same day the stock market lost a lot of value? This is why making an emergency fund - in cash money, in a savings account - comes before any kind of investing or even debt pay down. Period. So, why not cut out the fees and just do an auto-transfer of $10 per month, or whatever amount you assumed you wouldn't miss, to a savings account? Once you have a thousand bucks, or 3 months worth of expenses for when life hits the fan, then take a look at investing. Acorns is a cool idea, but for most people, it's probably a bad investment, at the very least in the psychological department. Instead, work on cutting the spending instead of rewarding it. Build an emergency fund, attack your high interest debt, and take advantage of your retirement accounts. Take the zero day challenge and reward yourself for not spending, instead of rewarding yourself for spending. You'll build wealth much faster that way! Acorns is a fun idea, but paying down high interest debts and maxing out retirement accounts should happen first! You can't save by spending, and Acorns is not a way out of having to face your crappy spending habits. Acorns offers an IRA version called "Acorns Later". This is a great idea if you are ready to begin investing. This post may contain affiliate links, but as always, I give it to you straight when reviewing products. I don't personally use acorns because I invest intentionally, with whole dollars, not pocket change! That being said, go for it if you've given it some thought and want to try Acorns.